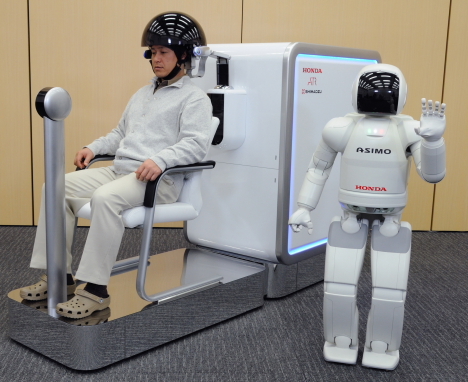 Honda has developed new brain-machine interface (BMI) technology that allows humans to control the Asimo humanoid robot simply by thinking certain thoughts. When the user simply thinks about moving his or her right hand, the pre-programmed Asimo responds several seconds later by raising its right arm. Likewise, Asimo lifts its left arm when the person thinks about moving their left hand, it begins to walk when the person thinks about moving their legs, and it holds its hand up in front of its mouth when the person thinks about moving their tongue. 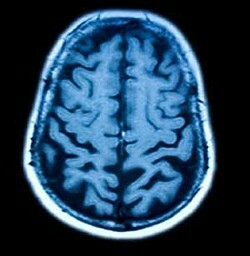 The high-precision BMI technology relies on three different types of brain activity measurements. EEG (electroencephalography) sensors measure the slight fluctuations in electrical potential on the scalp that occur when thinking, while NIRS (near-infrared spectroscopy) sensors measure changes in cerebral blood flow. Newly developed information extraction technology is used to process the complex data from these two types of sensors, resulting in a more accurate reading. The system reportedly has an accuracy rate of more than 90%. The use of EEG and NIRS sensors makes the new system more compact than previous BMI systems that rely on bulkier fMRI (functional magnetic resonance imaging) technology. Although the system is small enough to be transported from place to place, the developers plan to further reduce the size. Honda, which has been conducting BMI research and development with ATR since 2005, is looking into the possibility of one day using this type of interface technology with artificial intelligence and robotics to create devices that users can operate without having to move. Your gain, my pain? New research from Japan shows that the human brain treats feelings of envy like physical pain, while schadenfreude -- the pleasure derived from another person's misfortune -- triggers the brain's reward circuits. The findings, published in the February 13 online edition of Science magazine, suggest our brains may be wired to treat abstract feelings much more like concrete physical experiences than was previously thought. Led by Hidehiko Takahashi of the National Institute of Radiological Sciences (NIRS), the researchers used functional magnetic resonance imaging (fMRI) to monitor the brain activity of 19 male and female university students while they read two stories about other fictional students. The first story described the success of three characters: (A) a superior "rival" student of the same gender in the same field of study, (B) a superior student of the opposite gender in a different field of study, and (C) an average student of the opposite gender in a different field of study. The subjects were then asked to rate their own level of envy toward the characters on a scale of 1 to 6. Character A garnered the most envy and triggered a high level of activity in the anterior cingulate cortex, which plays a key role in processing pain. 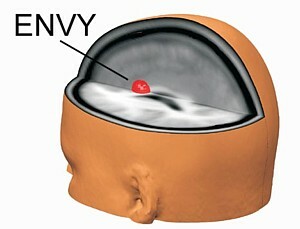 The results indicate that the brain uses the same circuitry to process both social pain (envy) and physical pain. The subjects then read a second story in which characters A and C suffer a series of misfortunes, including food poisoning and financial trouble. The fMRI data showed that the depiction of character A's hardships induced greater activity in the ventral striatum, the "reward reaction" area of the brain that normally lights up when receiving social and financial reward. In addition, the researchers were able to predict which subjects would experience stronger schadenfreude (ventral striatum activity) when reading story 2, based on the degree of envy (anterior cingulate cortex activity) they experienced when reading story 1, suggesting a strong relationship between the way the brain processes the two feelings. "We now have a better understanding of the mechanism at work when people take pleasure in another's misfortune," says Takahashi of the research. "Perhaps our findings can be put to use in the field of psychological counseling." 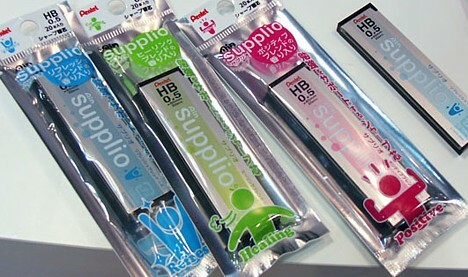 As Japanese consumers become ever more "fussy" over food safety issues, there is a growing demand for technology that improves food quality. To ease the minds of health-conscious meat-eaters, researchers at Japan's National Institute of Animal Health (NIAH) have developed a convenient method for identifying cattle infected with mad cow disease, simply by measuring the brain waves they produce in response to audio stimuli. To develop and test the new method, the researchers infected 11 healthy cows with mad cow disease and observed the onset of symptoms and changes in brain activity. Mad cow disease (a.k.a. Bovine Spongiform Encephalopathy, or BSE) is a fatal infectious disease that affects the central nervous system of cattle (and humans), turning the brain into a sponge-like substance. Symptoms of the disease include loss of muscle control, inability to stand or walk properly, agitation, and red eyes. Approximately 24 months after infection, the 11 test cows began to exhibit the typical physical signs of BSE. However, at around 22 months after infection -- before the physical symptoms became evident -- the researchers discovered that the brains of the infected cows had a delayed reaction to sound. In all 11 mad cows, the brain waves elicited in response to audio stimuli were a few tenths of a millisecond slower than in healthy cows. The researchers believe the acoustic nerves responsible for transmitting sound impulses to the brain became damaged as the disease progressed, resulting in a delayed response time. 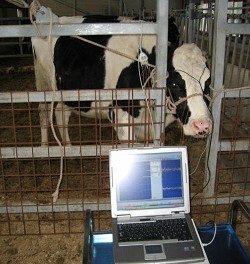 By using a device that measures this delay, ranchers can identify mad cows in their herds, the researchers suggest. While the newly developed method is still less accurate than conventional lab testing of brain samples taken from carcasses, it does make it easier to detect possible infection at an early stage, before outward signs of the disease appear. The researchers, who plan to study the data further and improve the accuracy of the test, eventually hope to develop a portable version of the device. Researchers at Osaka University are stepping up efforts to develop robotic body parts controlled by thought, by placing electrode sheets directly on the surface of the brain. Led by Osaka University Medical School neurosurgery professor Toshiki Yoshimine, the research marks Japan's first foray into invasive (i.e. requiring open-skull surgery) brain-machine interface research on human test subjects. The aim of the research is to develop real-time mind-controlled robotic limbs for the disabled, according to an announcement made at an April 16 symposium in Aichi prefecture. Although brain waves can be measured from outside the scalp, a stronger, more accurate signal can be obtained by placing sensors directly on the brain -- but that requires open-skull surgery, making it more difficult to recruit volunteer test subjects. 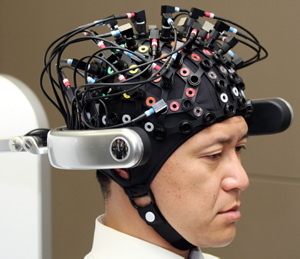 The researchers, who have filed a license application with the Osaka University Hospital ethics board, are working to enlist willing subjects already scheduled to have brain electrodes implanted for the purpose of monitoring epilepsy or other conditions. The procedure, which does not involve puncturing the cortex, places an electrode sheet at the central sulcus, a fold across the center of the brain near the primary motor cortex (which is responsible for planning and executing movements). To date, the researchers have worked with four test subjects to record brain wave activity generated as they move their arms, elbows and fingers. Working with Advanced Telecommunications Research Institute International (ATR), the researchers have developed a method for analyzing the brain waves to determine the subject's intended activity to an accuracy of greater than 80%. The next step is to use the data to control robot arms developed by the University of Tokyo's Department of Precision Engineering. In an effort to accelerate the development of next-generation automobiles and robots, Toyota is turning to some of Japan's top neuroscientists. According to a December 14 announcement, the automaker has teamed up with the Institute of Physical and Chemical Research (RIKEN) in a 20-year project aimed at researching the human brain and developing neurotechnology-based auto safety systems, sophisticated robots, and machinery that users can operate with their minds. Toyota and RIKEN will conduct the brain research at the recently established RIKEN BSI-Toyota Collaboration Center, which will initially be staffed by 30 researchers, 5 of whom are from Toyota. The research will fall into three broad categories: (1) neuro-driving research, which focuses on the mental processes at work as drivers perceive, judge and react to the external environment, (2) neuro-robotics research, which focuses on how the brain processes information, and (3) mind-health research, which focuses on the physiology of the brain and nervous system and the relationship between the brain and physical health. Through the neuro-driving research, which is expected to shed new light on how the brain works as drivers perceive obstacles and operate their vehicles, Toyota ultimately hopes to develop auto safety technology that can completely prevent all traffic accidents. In addition, the automaker explains that the purpose behind the neuro-robotics research is to develop advanced robots that can interact more effectively with humans. Toyota, which sees robotics as one of its core businesses in the future, has been stepping up efforts in recent years to develop "lifestyle support" androids for use in nursing and health care. The company also believes the research will lead to the development of brain-machine interfaces that allow users to operate equipment by thought. Toyota explains that the decision to pursue brain research is driven by an ever-increasing demand for more sophisticated automotive and robot technology. With a better understanding of the cognitive mechanisms underlying human feelings, thoughts and actions, the company reckons it can get a head start in the race to develop the cars and robots of the future. 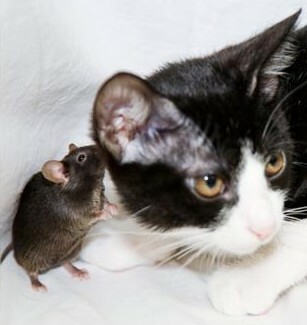 A team of University of Tokyo researchers led by professors Hitoshi Sakano and Ko Kobayakawa have announced they have genetically engineered a mouse that does not fear cats, simply by controlling its sense of smell. By tweaking genes to disable certain functions of the olfactory bulb -- the area of the brain that receives information about smells directly from olfactory receptors in the nose -- the researchers were able to create a "fearless" mouse that does not try to flee when it smells cats, foxes and other predators. In studying the genetically modified mouse, the researchers have concluded that the evasive behavior exhibited by mammals when they smell predators may be genetically hardwired into the olfactory bulb from birth, and not learned through experience as commonly believed. The research suggests that the mechanism by which mammals determine whether or not to fear another animal they smell -- and whether or not to flee -- is not a higher-order cerebral function. Instead, that decision is made based on a lower-order function that is hardwired into the neural circuitry of the olfactory bulb. However, in other experiments, the researchers demonstrated that mice with impaired olfactory functions can also be taught to fear their predators. According to Professor Sakano, the research indicates that behavior in the mammalian brain is determined both by instincts coded into the genes and by "associative circuitry" that allows responses to be learned through the environment. The results of the research, which are to be published in the November 8 online edition of the British science journal Nature, are expected to help scientists better understand the structure of the brain's neural circuitry responsible for processing information about the outside world. While recent developments in brain-computer interface (BCI) technology have given humans the power to mentally control computers, nobody has used the technology in conjunction with the Second Life online virtual world -- until now. A research team led by professor Jun'ichi Ushiba of the Keio University Biomedical Engineering Laboratory has developed a BCI system that lets the user walk an avatar through the streets of Second Life while relying solely on the power of thought. To control the avatar on screen, the user simply thinks about moving various body parts -- the avatar walks forward when the user thinks about moving his/her own feet, and it turns right and left when the user imagines moving his/her right and left arms. The system consists of a headpiece equipped with electrodes that monitor activity in three areas of the motor cortex (the region of the brain involved in controlling the movement of the arms and legs). An EEG machine reads and graphs the data and relays it to the BCI, where a brain wave analysis algorithm interprets the user's imagined movements. A keyboard emulator then converts this data into a signal and relays it to Second Life, causing the on-screen avatar to move. In this way, the user can exercise real-time control over the avatar in the 3D virtual world without moving a muscle. Future plans are to improve the BCI so that users can make Second Life avatars perform more complex movements and gestures. The researchers hope the mind-controlled avatar, which was created through a joint medical engineering project involving Keio's Department of Rehabilitation Medicine and the Tsukigase Rehabilitation Center, will one day help people with serious physical impairments communicate and do business in Second Life.